DIE Veneris, videlicet, 12 die Augusti. Thanks to the Earl of Clare, for his Conduct at York. Answer from the H. C. about the Monmouth and Bucks Instructions. Letter from the King, about a Clause in His Proclamation, concerning the Earl of Essex and his Officers, &c.
Lords Lieutenants of Somerset and Wilts to repair there. Message to the H. C. to acquaint them with it, and that the Lords are ready to give Judgement against the Lord Mayor. Deputy Lieutenants of Kent to send up Arms in several Houses. Committee of Safety to be informed of the Proceedings at York, and elsewhere. Sir Ralph Dutton sent for, for raising Soldiers. E. of Portland removed to The Tower. H. C. demand Judgement against him. A new Lord Mayor to be chose. Lieutenant of The Tower to release no Prisoners, but by Warrant from this House. Sir Richard Gurney committed to The Tower. The Judgement against the Lord Mayor of London. Instructions for the Deputy Lieutenants of Monmouthshire and Buckinghamshire. The Speaker gave the Earl of Clare Thanks, in the Name of the House, for his Carriage at Yorke, which tended to the Preservation of the Peace of the Kingdom; and that the House is well pleased with his Return: And his Lordship gave this House Thanks for the same. Next, was read a Letter from the King, directed To Our Trusty and Well-beloved the Speaker of Our House of Peers. "Right Trusty and Well-beloved, We greet you well. Whereas We have discovered, in Our Proclamation sent to you this Day, a Clause intended and directed by Us to have been omitted in the Press, Our Will and Pleasure is, That you forthwith deliver, to be read in Our House of Peers, this Our Proclamation, in which the said Clause is inserted, which you shall receive herewith; to the End that Our said House may take Care that the same may be communicated to Robert Earl of Essex, and the rest of the Members of either of Our Houses of Parliament as have listed themselves under his Command; and for so doing, this shall be your sufficient Warrant. "Given at Our Court at Yorke, the 9th Day of August, 1642." Next, the Proclamation was read. This House professed to be constant to their former Resolution, for the Preservation of the King and Kingdom, and to continue in their Loyalty to the King. Ordered, That the Earl of Bedford shall To-morrow go into Som'settshire, and the Earl of Pembrooke into Wilts, to settle the Peace of those Counties. To let them know, that this House hath appointed the Earl of Bedford to go into Somersetshire, and the Earl of Pembrooke into Wilts, To-morrow; and that this House is ready to give Judgement against the Lord Mayor of London, if the House of Commons will come up, with their Speaker, to demand (fn. 1) it; also to deliver to the House of Commons the Letter and Proclamation sent from the King. Ordered, That the Deputy Lieutenants of the County of Kent shall take into their Custody the Arms in the House of the Earl of Dorsett at Knowlehouse, and the Arms of the Duke of Richmond at Cobham, and the Arms of the Lord Abergavenny, and convey them safely to the Lords (fn. 1) in Parliament, who will give further Directions herein. Ordered, That, for this Fortnight, no Private Business shall be mentioned. Ordered, That it is recommended to the Committee for the Safety of the Kingdom, to take Care to procure Correspondency and Intelligence of the Passages and Proceedings at Yorke, and in other Places, for the Peace of the Kingdom. The House being informed, "That Sir Ralph Dutton beats up a Drum, in Glocestershire and Hereford, for Soldiers:" Hereupon it is Ordered, That he shall be apprehended, and brought before this House, as a Delinquent; and Lord Lieutenants, and Deputy Lieutenants, and all His Majesty's Officers, shall be assisting to apprehend him. Ordered, That the Earl of Portland shall be removed from the House of Sheriff Garrett, to The Tower of London, there to remain until the Pleasure of this House be further known. That the House of Commons will come up presently, with their Speaker, to demand Judgement against the Lord Mayor. In the mean Time, the Lords went and robed themselves. The Lords being set in their Robes, the House of Commons came, with their Speaker; and then the Gentleman of the Black Rod brought the Lord Mayor to the Bar, who kneeled until the Speaker, by Direction of the House, bid him stand up. Then the Speaker said, "That the Knights, Citizens, and Burgesses of the House of Commons, having impeached Sir Ricd. Gurney, Knight and Baronet, Lord Mayor of the City of London, of divers Crimes and Misdemeanors, he demanded, in the Name of the House of Commons, Judgement against him." Whereas the Lord Mayor is disabled, by the Sentence of the Lords in Parliament, from being Lord Mayor of the City of London any longer; Ordered, That Sir Nic. Raynton shall presently call a Court of Aldermen, and proceed, in the usual Manner, to the Choice of a new Lord Mayor of the City of London. Ordered, That the Lieutenant of The Tower shall not release any Prisoner committed to him from this House, by virtue of any Warrant or Letter, without first acquainting this House of it, and having an Order of this House, under the Clerk's Hand. Ordered, That Sir Ricd. Gurney, Knight and Baronet, shall be committed to The Tower of London, there to remain in safe Custody, until the Pleasure of this House be further known; and that the Lieutenant of The Tower is to receive him accordingly. 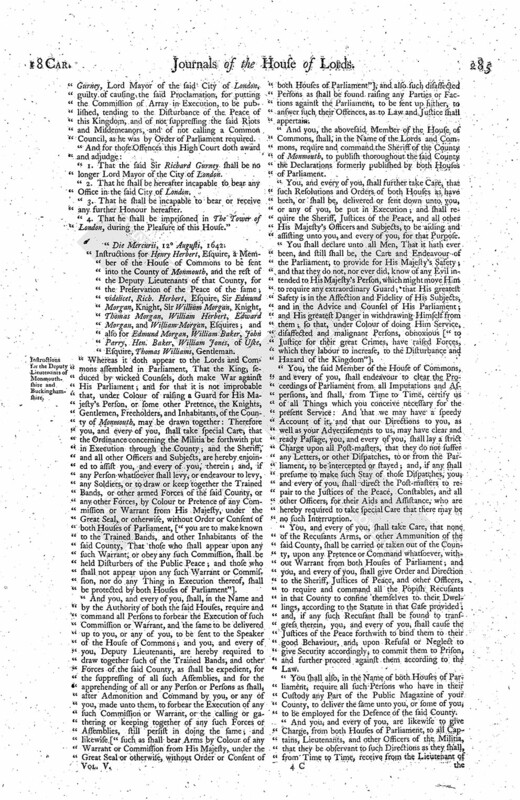 "The Lords, having taken the said Charges into their due Consideration, do find the said Sir Richard Gurney, Lord Mayor of the said City of London, guilty of causing the said Proclamation, for putting the Commission of Array in Execution, to be published, tending to the Disturbance of the Peace of this Kingdom, and of not suppressing the said Riots and Misdemeanors, and of not calling a Common Council, as he was by Order of Parliament required. "1. That the said Sir Richard Gurney shall be no longer Lord Mayor of the City of London. "2. That he shall be hereafter incapable to bear any Office in the said City of London. "3. That he shall be incapable to bear or receive any further Honour hereafter. "4. That he shall be imprisoned in The Tower of London, during the Pleasure of this House." "Die Mercurii, 12 Augusti, 1642. "Instructions for Henry Herbert, Esquire, a Member of the House of Commons to be sent into the County of Monmouth, and the rest of the Deputy Lieutenants of that County, for the Preservation of the Peace of the same; videlicet, Rich. Herbert, Esquire, Sir Edmund Morgan, Knight, Sir William Morgan, Knight, Thomas Morgan, William Herbert, Edward Morgan, and William Morgan, Esquires; and also for Edmund Morgan, William Baker, John Parry, Hen. Baker, William Jones, of Uske, Esquire, Thomas Williams, Gentleman. 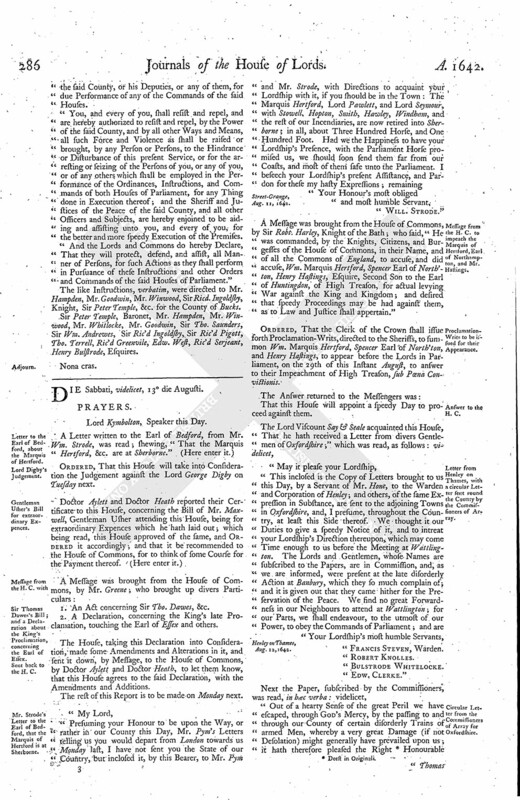 "Whereas it doth appear to the Lords and Commons assembled in Parliament, That the King, seduced by wicked Counsels, doth make War against His Parliament; and for that it is not improbable that, under Colour of raising a Guard for His Majesty's Person, or some other Pretence, the Knights, Gentlemen, Freeholders, and Inhabitants, of the County of Monmouth, may be drawn together: Therefore you, and every of you, shall take special Care, that the Ordinance concerning the Militia be forthwith put in Execution through the County; and the Sheriff, and all other Officers and Subjects, are hereby enjoined to assist you, and every of you, therein; and, if any Person whatsoever shall levy, or endeavour to levy, any Soldiers, or to draw or keep together the Trained Bands, or other armed Forces of the said County, or any other Forces, by Colour or Pretence of any Commission or Warrant from His Majesty, under the Great Seal, or otherwise, without Order or Consent of both Houses of Parliament, ["you are to make known to the Trained Bands, and other Inhabitants of the said County, That those who shall appear upon any such Warrant, or obey any such Commission, shall be held Disturbers of the Public Peace; and those who shall not appear upon any such Warrant or Commission, nor do any Thing in Execution thereof, shall be protected by both Houses of Parliament"]. 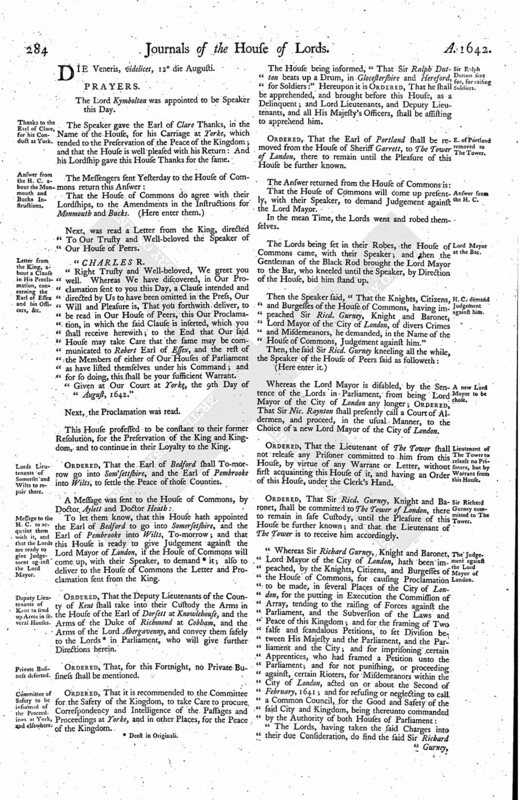 "And you, and every of you, shall, in the Name and by the Authority of both the said Houses, require and command all Persons to forbear the Execution of such Commission or Warrant, and the same to be delivered up to you, or any of you, to be sent to the Speaker of the House of Commons; and you, and every of you, Deputy Lieutenants, are hereby required to draw together such of the Trained Bands, and other Forces of the said County, as shall be expedient, for the suppressing of all such Assemblies, and for the apprehending of all or any Person or Persons as shall, after Admonition and Command by you, or any of you, made unto them, to forbear the Execution of any such Commission or Warrant, or the calling or gathering or keeping together of any such Forces or Assemblies, still persist in doing the same; and likewise ["such as shall bear Arms by Colour of any Warrant or Commission from His Majesty, under the Great Seal or otherwise, without Order or Consent of both Houses of Parliament"], and also such disaffected Persons as shall be found raising any Parties or Factions against the Parliament, to be sent up hither, to answer such their Offences, as to Law and Justice shall appertain. "And you, the abovesaid Member of the House of Commons, shall, in the Name of the Lords and Commons, require and command the Sheriff of the County of Monmouth, to publish thoroughout the said County the Declarations formerly published by both Houses of Parliament. "You, and every of you, shall further take Care, that such Resolutions and Orders of both Houses as have been, or shall be, delivered or sent down unto you, or any of you, be put in Execution; and shall require the Sheriff, Justices of the Peace, and all other His Majesty's Officers and Subjects, to be aiding and assisting unto you, and every of you, for that Purpose. "You shall declare unto all Men, That it hath ever been, and still shall be, the Care and Endeavour of the Parliament, to provide for His Majesty's Safety; and that they do not, nor ever did, know of any Evil intended to His Majesty's Person, which might move Him to require any extraordinary Guard; that His greatest Safety is in the Affection and Fidelity of His Subjects, and in the Advice and Counsel of His Parliament; and His greatest Danger in withdrawing Himself from them; so that, under Colour of doing Him Service, disaffected and malignant Persons, obnoxious ["to Justice for their great Crimes, have raised Forces, which they labour to increase, to the Disturbance and Hazard of the Kingdom"]. "You, the said Member of the House of Commons, and every of you, shall endeavour to clear the Proceedings of Parliament from all Imputations and Aspersions, and shall, from Time to Time, certify us of all Things which you conceive necessary for the present Service: And that we may have a speedy Account of it, and that our Directions to you, as well as your Advertisements to us, may have clear and ready Passage, you, and every of you, shall lay a strict Charge upon all Post-masters, that they do not suffer any Letters, or other Dispatches, to or from the Parliament, to be intercepted or stayed; and, if any shall presume to make such Stay of those Dispatches, you, and every of you, shall direct the Post-masters to repair to the Justices of the Peace, Constables, and all other Officers, for their Aids and Assistance, who are hereby required to take special Care that there may be no such Interruption. "You, and every of you, shall take Care, that none of the Recusants Arms, or other Ammunition of the said County, shall be carried or taken out of the County, upon any Pretence or Command whatsoever, without Warrant from both Houses of Parliament; and you, and every of you, shall give Order and Direction to the Sheriff, Justices of Peace, and other Officers, to require and command all the Popish Recusants in that County to confine themselves to their Dwellings, according to the Statute in that Case provided; and, if any such Recusant shall be found to transgress therein, you, and every of you, shall cause the Justices of the Peace forthwith to bind them to their good Behaviour, and, upon Refusal or Neglect to give Security accordingly, to commit them to Prison, and further proceed against them according to the Law. "You shall also, in the Name of both Houses of Parliament, require all such Persons who have in their Custody any Part of the Public Magazine of your County, to deliver the same unto you, or some of you, to be employed for the Defence of the said County. "And you, and every of you, are likewise to give Charge, from both Houses of Parliament, to all Captains, Lieutenants, and other Officers of the Militia, that they be observant to such Directions as they shall, from Time to Time, receive from the Lieutenant of the said County, or his Deputies, or any of them, for due Performance of any of the Commands of the said Houses. "You, and every of you, shall resist and repel, and are hereby authorized to resist and repel, by the Power of the said County, and by all other Ways and Means, all such Force and Violence as shall be raised or brought, by any Person or Persons, to the Hindrance or Disturbance of this present Service, or for the arresting or seizing of the Persons of you, or any of you, or of any others which shall be employed in the Performance of the Ordinances, Instructions, and Commands of both Houses of Parliament, for any Thing done in Execution thereof; and the Sheriff and Justices of the Peace of the said County, and all other Officers and Subjects, are hereby enjoined to be aiding and assisting unto you, and every of you, for the better and more speedy Execution of the Premises. "And the Lords and Commons do hereby Declare, That they will protect, defend, and assist, all Manner of Persons, for such Actions as they shall perform in Pursuance of these Instructions and other Orders and Commands of the said Houses of Parliament." The like Instructions, verbatim, were directed to Mr. Hampden, Mr. Goodwin, Mr. Winwood, Sir Ricd. Ingoldsby, Knight, Sir Peter Temple, &c. for the County of Bucks. Sir Peter Temple, Baronet, Mr. Hampden, Mr. Winwood, Mr. Whitlocke, Mr. Goodwin, Sir Tho. Saunders, Sir Wm. Andrewes, Sir Ric'd Ingoldsby, Sir Ric'd Pigott, Tho. Terrell, Ric'd Greenvile, Edw. West, Ric'd Serjeant, Henry Bulstrode, Esquires.